The IRS uses Notice CP87A to question your right to claim a dependency exemption and if you are denied, this will lead to a rejection of all your related credits or benefits of the exemption, such as the Child Tax Credit, the Earned Income Credit & the Additional Child Tax Credit. Most often this has happened because someone else (i.e. an ex-spouse, a grandparent, etc.) has claimed the same dependent on their return so the IRS has 2 returns claiming the same dependent. One of the taxpayers may want to file an amended return. Often, a State Court has made a support order addressing who in entitled to the deduction and violations of this order can become contempt. But, the IRS ignores State Court orders. The exemption is usually given to the taxpayer who supported & housed the dependent for the greater part of the year. (See Pub. 501, Pub. 504) This can be easily proven from the facts or it may become more difficult when 2 (or more) taxpayers claim the same dependent. This is not technically an audit but the proof necessary to win your case must be gathered & organized in the same way. 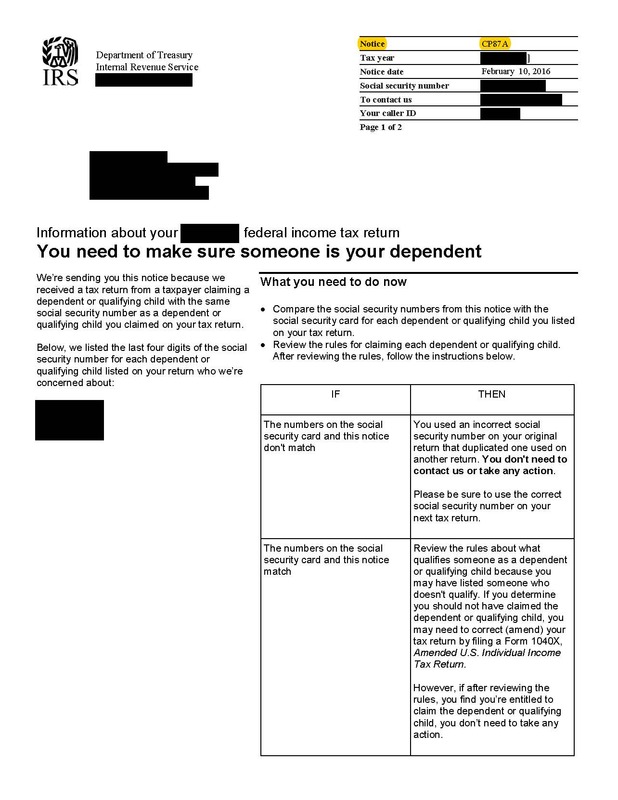 If you are entitled to the deduction (or the other taxpayer amends their return) then no response will be necessary. But, don't be surprised if the IRS sends you Notice CP75 demanding your response. This Notice is not a bill but may lead to a math error adjustment if your response is inadequate. Your response to the IRS must be carefully constructed & precise. The IRS will likely want to see school records, medical records, birth records, etc. & the various expenses associated with dependent care. The IRS will not review files which are improperly prepared & it takes a lot of work to arrange a file that is acceptable to the IRS. They may impose a "negligent record-keeping" penalty or "accuracy-related" penalties for poorly kept records. See Notice 746. Plus, if you lose the right to claim the dependency exemption for this year it will be denied to you for all future years as well. So, it is critically important to fight the case now. However, you must completely organize & properly present your file or the IRS will reject it. Fortunately, the TaxHelpAudit program has specific & direct video, audio & text instructions to prepare & contest your case with the IRS. Then, the TaxHelpLaw attorney, J. David Hopkins, JD, LLM is available for representation or consultation!